I miss my Nintendo 64. I picked mine up while I was in college. Worked n and off for a pool and spa place and earned one for my troubles. Cash would have been very cool but I think I got way more entertainment out of the N64 over time than I ever would have from the same amount of money. Due to the gameplay, the game library and the fact that four people could play on one system, we logged many an hour on the N64 in the dorm. Here are my four favorite games that I had and played the crap out of on this system. 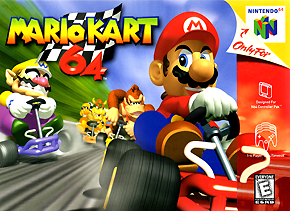 Mario Kart 64 was certainly one of the winners and a fav in the dorm. There were days that the game started early in the morning and players switched on and off all day until midnight or beyond. The graphics were good, TVs were big enough to play four people at a time on one screen and we could all play round-robin tournaments and never get bored. It was ridiculous how quickly we all learned and memorized the maps. And we all had our favorite characters to play, thinking they gave us distinct advantages. I am still not convinced that any of the various playable characters were any better than any other. There was something about the competition, the flinging of shells at each other and the flinging of insults around the TV that made this game a joy to play, whether you were any good at it or not. 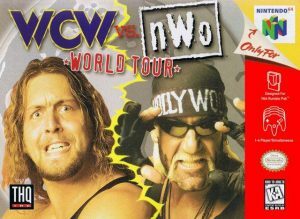 WCW vs NWO: World Tour might be my favorite wrestling game of all time. It is not the best, it is not the end all be all, but it was my favorite. The graphics were great for the time. I was really into wrestling as well. We would watch on Mondays with two TVs going so that we could watch WCW and WWF at the same time. Playing those characters that we all loved to watch on Mondays and during the pay-per-views was fantastic. Add to this the fact that the gameplay was easy and you had a really fun game. When I say that the gameplay was easy it might be the easiest wrestling game ever made. Learn the combinations and it all comes down to reaction time. Freaking great game! Of all of the games that we played together, GoldenEye was my favorite. I had played First Person shooter style games before but this was the first time that I could play against someone else. I learned the maps. I learned the weapons. i had my favorite spots to run the game from and I was unbeatable. Now, that was amongst my peers in college and I not that would be assassin in FPS games today. In fact, I am very mediocre. 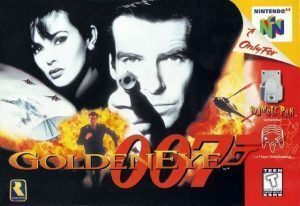 I still ove playing a good FOS but none will ever touch GoldenEye for sheer fun and enjoyment. In particular Man with the Golden Gun matches that were one shot one kill – those were the best. 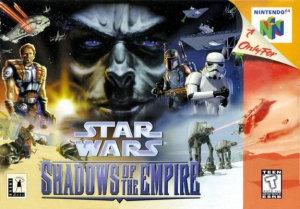 For single player games, it was Shadows of the Empire. We were all Star Wars geeks. We loved all things Star Wars and in particular, those of us that had read the book were completely jazzed about the fact that they were going to be releasing a Shadows of the Empire game. This game followed the novel better than any game based on a book or movie ever has. It was fun to play, you got to relive some of the great moments of the novel and you got to do a little bit of everything. Third person action game, meets flight simulator, meets swope bike pilot. Again, it was the first time I had ever played anything like this and I loved every miniute of it. We even set down and beat the thing in one sitting. In the end, this was one of the most used video game consoles that I ever owned. Hours of game play with friends and family and it was catridge based so the loads times didn’t take forever. I may have to go see if I can find one of these and buy it again.